Editor/Author Hodgdon, Barbara and Worthen, W. B. 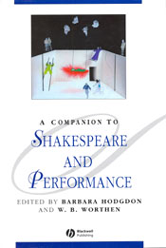 A Companion to Shakespeare and Performance provides a state-of-the-art engagement with the rapidly developing field of Shakespeare performance studies. Redraws the boundaries of Shakespeare performance studies. Considers performance in a range of media, including in print, in the classroom, in the theatre, in film, on television and video, in multimedia and digital forms. Introduces important terms and contemporary areas of enquiry in Shakespeare and performance. Raises questions about the dynamic interplay between Shakespearean writing and the practices of contemporary performance and performance studies. Written by an international group of major scholars, teachers, and professional theatre makers.